Though Deepavali is my favourite festival, and I simply loved it for fireworks and sharing of sweets and snacks, Pongal is an occasion I quite admire for its significant phase on life. Pongal is a grand festival in Tamil Nadu that celebrates the thanksgiving of nature and harvesting season. On this time, farmers set to harvest their fully grown crops and make Pongal (a dish made by boiling of rice) out of it and dedicate it to the sun, which is the source of energy for all. Pongal, which celebrated for four days (Jan 14-17), also worships the cattle – which supports human in cultivation for great productivity – and celebration of bulls, for their endurance and mighty on tillage. Though tractors and harvesting machines have replaced the man and animals lately, the small scale farmers are still depend on cattle and I could see bulls ploughing lands, even today at the outskirts of Chennai. This is the time people has to understand, however mechanism has developed to help humans and throw out cattle’s from field, they (bulls) still need to be involved in farming and cows for milking to sustain them from decline. Just like bulls used for ploughing and bullock carts, Jallikattu is a traditional sports (conducted during the festival of Pongal) where bulls are let loose into an open space (one by one) and man has to control the bull or grasp it for some time. The sports has been banned by the Supreme Court for last couple of years, following the complaint filed by animal welfare activists that bulls are ill-treated during the training and the event. Even though few days back, the central government gave a green signal to conduct the sports played according to the regulations the Supreme Court has formed in its former reports. The Apex Court has once again ruled out the decision of the central govt. to conduct the event and the people who have been in great delight (followed by the union govt. consent) had been disappointed now. I know everyone has an opinion on the sports and reason to support and oppose and for me this is not just a sports, but a way to keep alive the bulls and sustain their relationship. Because I believe, only until the sport is here, the bulls (that are specifically breed for the event) will continue to exist. The time I appreciate the animal welfare activists, for bringing out the cruelty behind this sport and ill-treats while taming the bulls, upon which the Supreme Court brought some restrictions in conduction the game in 2007 and until 2014 the event has went formal, taking a dramatic change in the pattern of its conduct. 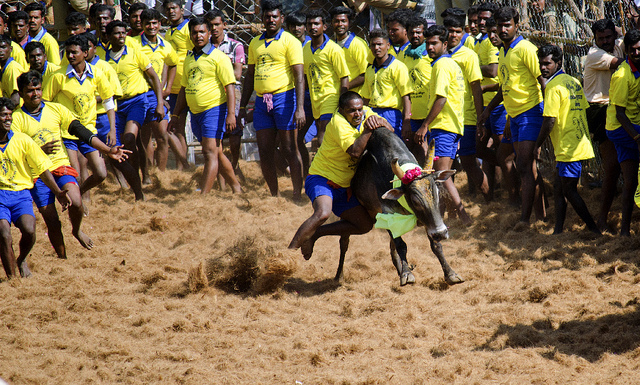 The event has been captured in videography thoroughly – to keep certain the rules are followed and bulls aren’t harmed, and the players, who are subjected to catch the bulls, have given uniform and are forced to take physical test before entering the ground. Unlike earlier, where the players and audience are blend with crowed and many who aren’t fit enough are injured through the cause, and to prevent this the players and onlookers are separated by a strong fence now, and the age is also restricted to be between 20 and 40 for those who like to play. The game’s rules have also been simplified from being insane, where too many hold on a bull and pulling its tail… the players are allowed to grasp only the bulls hump and holding there for 30 seconds or run 30 feet from the entrance (called Vadi Vasal) where the bulls are let loosed. When things being right and conductors and players are conscious about the rules, what makes the animal activists asking for a ban? I am not supporting animals being harmed in anyways, but I strongly believe without hard work and struggles nothing survives. Bulls are hardworking animals and if we haven’t let them play and treated in right manner it will becomes weak. Experts believe that a bull with full vigour breeds strong bovines, and for that these animals has to be active and endure. And only till their need is there, the people will keep support the bulls and for those bovines were the livelihoods keeping them alive and healthy is much needed. Beside these what bothers me more was the survival of bulls! A question rises in me, what is the state of bulls if the Jallikattu is prevented? Or any kinds of activity that involve bulls are restrained? Just being conscious that no animals (the domesticated) are harmed is enough to preserve them? The noted cattle species Kangeyam, an indigenous breed of India, is on the verge of life along with many other species. It’s easy for us to support animal’s welfare and look after our job, which does not involve cattle and it won’t going to bother us further. But for farmers, the animal’s welfare as well the survival of bulls is very important on the race. The tradition and culture can be transformed according the comfort of life, unless it has nothing meaningful. I don’t see Jallikattu as just the traditional courageous sports, but ways to keep sustain the bulls and active their breed. According to Kala Karthi, Jallikatu is created not for the sports, but for training the users in controlling their bovines. Though I am not sure about the tradition behind it, the Jallikattu is perhaps created to showcase manpower and used as a platform to marry the virgin by taming the bull that reared by her family. Today it is played (maybe) to sustain the practice/tradition and existence of bulls! In the diary industry, there is far more cruelty towards cows. But we want our milk. Same way, people want Jallikkattu because they want their money. It is a commercialized sport. It's interesting that your courts seem to have as much control over the way people live and the things they can and cannot do as our courts have. A nice article here. Thanks for sharing. This is a very subjective topic that any animal lovers would strongly oppose using the animals for anything that poses a threat to their safety. Long ago during the ancient times, we have heard of those Romans and Europeans who used victims to fight hungry lions or wild beasts in their sport events while the hundreds would cheer from the arena. It was their annual sports events where their Kings & Queens also watched. It was nothing wrong to them in those days to witness the bloody fights that resulted deaths. It was banned eventually after so long. The best solution would be to let all animals live in peace and humans turn vegans as well. It is not easy to happen. Just my 2 cents. Happy Weekend Jeevan. Bull fighting has been banned in some countries, so perhaps this sport - for the sake of the bulls. If there is no unnecessary bloodshed, maiming or killing I am okay with the sport. Very old tradition...good thing the bulls are not harmed! This is a new tradition for me to hear about now. I can compare it to different things done around the world but this one would be a way a wild animal could be controlled for capture to aid in the farming process. We fence in all our animals but if that isn't happening then men would have to tackle them like I see in the photograph. You are a great teacher as you share your culture.